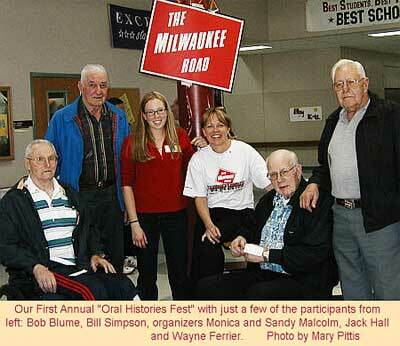 We have an event planned for this weekend involving both students and Milwaukee Road retirees in the area at our Oral History Fest. Students from the Cle Elum-Roslyn High School will be interviewing the retirees in 8 groups in the Middle School commons room this Saturday, April 12th, from 1 to 3 p.m. This is the Cascade Rail Foundation’s first organized attempt at trying to document some of the stories from the retirees of the Milwaukee and its historical influence in the area. Organized by Sandy Malcolm and her daughter Monica both history and journalism students will be the interviewers. Other supporters of this event include a grant from State Farm Insurance; the Northern Kittitas County Historical Society, Key Club and the Builder’s Club as well as the teachers involved Tom Wilson, Mike O’Donnel, and Jay Briggs. We hope to make this an annual event making it bigger and better every year. Video Clips and images from this event will grace our website over the next couple of weeks. Many thanks to Sandy and Monica for organizing this event. With out their organization this event would not be taking place. 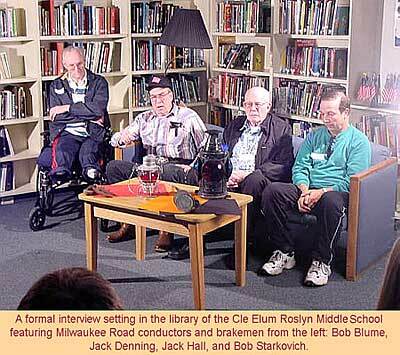 Our first organized “Oral Histories Fest” saw a large gathering of about 15+ retirees from the Milwaukee being interviewed by a roughly equivalent number of students in what turned out to be a well organized and very fun afternoon. At about 1pm the retirees began to show up along with some of the students, coaches and organizers to the middle school common room that was expertly decked out for a party. The room was complete with maroon and orange table covers, memorabilia, black and yellow balloons, props of railroad signage, a Milwaukee Road logo as well as cake and refreshments catered by Key Club! A social hour developed preceding the 2pm interviews as more retirees streamed in. This created a great opportunity for old friends and co-workers to get caught up on personal news. One notable encounter was between Gene Lawson and Ron Dent. Gene remembers Ron’s first day on the job when his father began training him to be a sub-station operator in Kittitas. If I had understood it right, they had last seen each other close to 50 years ago! At 2pm Mary gave an introduction and a briefing on the afternoon’s activities then seated each group of students and retirees along with their coaches at specific tables. This set the stage for introductions and informal interviews between the retirees and the students. While these discussions were taking place a more formal interview setting was used for each group and their coaches in the library. This is where the tech crew from Mr. O’Donnell’s class really shined. They set up living room furniture in a well lit corner of the library and gave each group of students about 15 minutes to interview. They recorded the whole process on videotape. From what I witnessed the students were very involved, enthusiastic and they got a warm reception and many interesting stories from the retirees (wish there was more time). For some of the students this was just an introduction to more one on one interviews with individual retirees. Kudos to the organizers for this event especially Sandy and Monica Malcoln, Mary Pittas and Rruss Holter from the Cascade Rail Foundation and the teachers involved including Mr. O’Donnell, Mr. Briggs and Mr. Wilson and many others that I did not get a chance to meet. This event was well planned, went smooth, and was real fun! The groundwork has been laid to build from for next year to make this “Oral Histories Fest” even more successful. Check out the “Video of the Week” link on the website (in about an hour) for an idea on what our afternoon was like.